When Groundwork Milwaukee and Milwaukee Urban Gardens became one entity on March 1, 2013, Milwaukeeans were advised, in a friendly way, to hang onto their hats. The joining of the two groups, which share a focus on urban agriculture, will allow for the streamlining of administrative costs, and both the expansion of current and development of new programs – all with an eye on the urban agriculture industry. The concept of urban agriculture as an industry might be hard to accept for some, who tend to associate “industry” with things loud and metallic, often done in dark, dirty warehouses. But Tim McCollow, grant monitor in the City’s Office of Environmental Sustainability, told the major players in the recent merger that Milwaukee needs to start thinking of urban agriculture as an industry. The US subsidized food policy hasn’t been exactly helpful to urban agriculture up to this point, as we know. McCollow and others hope that Milwaukee, which is viewed as one of the leaders in urban agriculture, can start to straighten out that policy. By continuing to develop awareness among the general public in Milwaukee of the value of urban gardening on a number of levels, programs such as the City’s HOME GR/OWN project can have an impact far beyond our borders. The shared energy and compatible goals of Groundwork Milwaukee (GWM) and Milwaukee Urban Gardens (MUG), along with a history of successful, combined programs, all feed into the existing momentum in expanding urban agriculture in Milwaukee. MUG will continue to exist as a separate entity, but as of March 1, it has become a program operating under the auspices of Groundwork Milwaukee. Each organization has retained its executive director – Bruce Wiggins of MUG and Mary Beth Driscoll of GWM. GWM, part of the Groundwork USA national network, was incorporated in Wisconsin in 2006. Its mission then, and continuing post-merger, is to partner with businesses, residents and government officials to revitalize neighborhoods, in part by transforming community liabilities into community assets. GWM has a three-pronged focus: Food, water and jobs. Blighted vacant lots turned into community gardens, improved water quality through partnerships to install green infrastructure and preparing young city residents for jobs through its First Green Jobs program, are some of the more prominent ways GWM has carried out its mission to date. MUG, incorporated in 2001, is a land trust. Its mission is to obtain land for community gardens. In partnership with the City of Milwaukee, it administers land lease programs and obtains hydrant permits from the City for use in watering those gardens. The merger of these two entities, both successful in their own right, is an example of the whole being more than the sum of its parts, especially for relatively young non-profit organizations. Administrative costs will be reduced, duplication of effort will be all but eliminated, and the new organization can capitalize on the positive reputations and programmatic enthusiasm enjoyed by both of the merged entities. The recession in the second half of the last decade was difficult for everyone, but especially tough on non-profit organizations and foundations. In the middle part of last year, the boards of directors of GWM and MUG began discussing a possible merger, helped by a hired board consultant. “There were enough similarities to create significant synergies,” Driscoll says. She points out the administrative efficiencies will allow a larger percentage of the precious dollars dribbling out of foundations to be devoted to programming. And the fact that MUG and GWM already had collaborated on a number of projects helped move the merger from mere concept to reality. Some of the programs that grew out of the collaboration between MUG and GWM are well known to Riverwest residents. Kilbourn Gardens began after MUG began administering the five-year lease from Milwaukee Water Works that had been secured by the garden’s early planners. 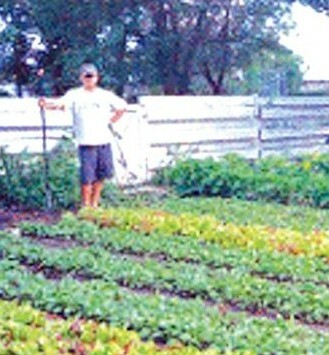 The Young Farmers, now a program of GWM, began at Kilbourn Gardens last year. This year, the Young Farmers became the first and only locally-based farm/garden to offer CSA – Community Supported Agriculture – shares at the recent Local Farmer Open House at the east side location of the Urban Ecology Center. Another Riverwest connection is that Young Farmers CSA shares can be purchased, in part, through time credits with the Milwaukee Area Time Exchange, formerly located in Riverwest, and now near Third and Highland. The Grow and Play Lot in the Harambee neighborhood is another example of the two groups working together successfully. MUG owns the property and GWM helps develop it in partnership with the community. And the gardens at All Peoples Church are yet further testament to successful collaboration and partnerships, and shared goals. MUG leased the land for the gardens from the City. The lot sits across the street from the church, at North 2nd and West Clarke Streets. And GWM developed its first partnership with Growing Power to build three hoop houses at the western end of the garden lot. MUG has worked with groups such as the Milwaukee Urban Agriculture Network and the Milwaukee Food Council on shared interests, as well. The city ordinances allowing beekeeping and chickens on residential lots came out of work pioneered by the Food Council. With truly spring-like weather – hopefully! – just around the corner, it’s exciting to watch and see what additional ideas and programs will grow out of the MUG/GWM merger. The enthusiasm and energy that have become hallmarks of each group can only increase as they continue to help each other. Milwaukee residents are well-advised to cling tightly to their head coverings in light of the blossoming momentum surrounding this development.